Staying vigilant about your safety may not be a college course but it's one of the most important lessons you can learn. A high state of awareness is essential now more than ever. You're exposed to things you've never seen. You're seeing things you've never pondered. People are acting so outside your norm, you wonder where you are or where they came from. On top of that, you have to learn and study and still get good grades! The Tactical Use of Pepper Sprays manual teaches you how to use your self-defense spray and goes over many techniques you should become familiar with, such as dealing with multiple assailants. The last item in this college woman safety kit is the cell phone stun gun. Even if someone is grabbing you or you are in the water, you will not get shocked. Only the person on the business end of this will feel it's devastating effect. If it gets up close and personal, use the stun gun! There are a number of things you can do to make your collegiate life safer, more secure and ultimately more enjoyable. By knowing you have done things to protect yourself, you'll have more peace of mind while walking about or turning in for the night inside your dorm room. Learn what help campus security can offer to increase your safety. If their services are only available in certain areas or if they do not patrol some portions of the campus at regular intervals, then this is valuable information to you. Most campuses have excellent provisions for lighting the most traveled paths after dark. Stick to these. Often the security for each dormitory is lax if it exists at all. Make sure that you keep your room locked at all times. Consider registering your more valuable items with the campus security to make identification easy. Let a roommate or friend know where you are going and how long you might be gone when you leave campus. Always enlist the company of at least one other person when jogging or exercising outside. Do not wear headphones as they can seriously impair your ability to predict and avoid a confrontation. Freshmen should "respectfully decline" to have photo and personal information published for distribution to the campus community. Fraternities and upperclassmen have abused this type of publication to "target" naive freshmen. Study the campus and neighborhood with respect to routes between your residence and class/activities schedule. Know where emergency phones are located. Share your class/activities schedule with parents and a network of close friends, effectively creating a type of "buddy" system. Give network telephone numbers to your parents, advisers, and friends. Always travel in groups. Use a shuttle service after dark. Never walk alone at night. Avoid "shortcuts". Survey the campus, academic buildings, residence halls, and other facilities while classes are in session and after dark to see that buildings, walkways, quad-rangles, and parking lots are adequately secured, lit and patrolled. Are emergency phones, escorts, and shuttle services adequate? To gauge the social scene, drive down fraternity row on weekend nights and stroll through the student hangouts. Are people behaving responsibly, or does the situation seem reckless and potentially dangerous? Remember, alcohol and/or drug abuse is involved in about 90% of campus crime. Carefully evaluate off-campus student apartment complexes and fraternity houses if you plan to live off campus. Doors and windows to your residence hall should be equipped with quality locking mechanisms. Room doors should be equipped with peepholes and deadbolts. Always lock them when you are absent. Do not loan out your key. Re-key locks when a key is lost or stolen. Card access systems are far superior to standard metal key and lock systems. Card access enables immediate lock changes when keys are lost, stolen, or when housing assignments change. Most hotels and hospitals have changed to card access systems for safety reasons. Higher education institutions need to adopt similar safety features. Always lock your doors and 1st and 2nd-floor windows at night. Never compromise your safety for a roommate who asks you to leave the door unlocked. Dormitories should have a central entrance/exit lobby where nighttime access is monitored, as well as an outside telephone which visitors must use to gain access. Dormitory residents should insist that residential assistants and security patrols routinely check for "propped doors" - day and night. Do not leave your identification, wallets, checkbooks, jewelry, cameras, and other valuables in open view. Program your phone's speed dial memory with emergency numbers that include family and friends. There are a number of inexpensive items you can use to further protect yourself and ensure you won't become a victim. Door Brace Steel door brace positively prevents opening of your dorm room. Window Alarm Easily attached window alarm is set off by vibrations. Door Knob Alarm - Hangs over the knob and alerts you if someone touches the door knob from the other side. Panic Alarms Personal alarms assist in calling out for help should you need it. 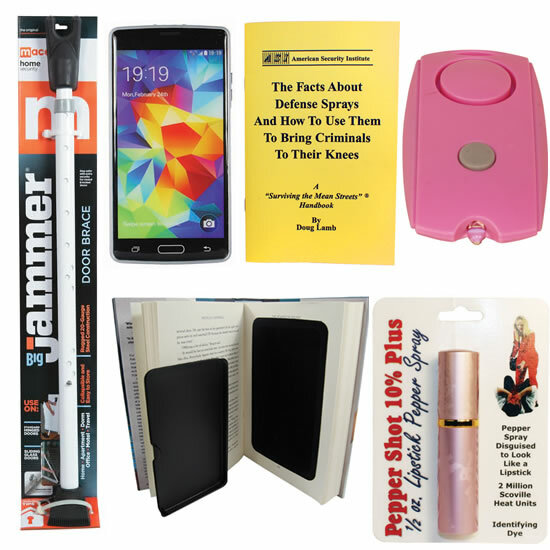 Diversion safes Store valuables in common objects that other students won't think to look.